The most famous resident of New York's Barbizon Hotel for Women was Sylvia Plath, who spent a month there in 1953. 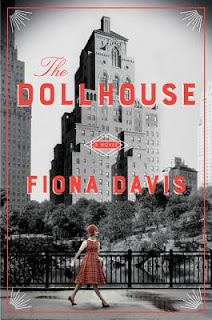 But in this forthcoming debut novel, Fiona Davis takes us back to the previous year when a young woman named Darby McLaughlin arrives for secretarial school and ends up involved in a tragedy. In 2016, a journalist named Rose is living in the same building, which has now mostly been converted to condos. But some of the same residents from the old days still live on the 4th floor, including Darby MaLaughlin. When Rose learns about Darby's past, she is determined to write a story about it, no matter how reclusive Darby is. The novel moves back and forth between these two different stories until we find out the truth of what happened on that fateful night. I often pass over the galleys I receive because I have so many books I already know I want to read that I don't want to put them aside for a book I know nothing about. But I was drawn in by the setting of this novel. A couple of years ago I read Pain, Parties, Work, which was about Sylvia Plath's life in New York during the summer of 1953, during which she lived in the Barbizon, and I was eager to return to that world. Unfortunately, this novel fell rather flat for me. Of the two stories, the 1950s one was the real meat of the novel, and the 2016 story felt like it was written as an afterthought. Nothing that happened in that part of the story felt realistic to me. Rose never felt like a real person, and her choices didn't always make sense. I didn't care at all about her stupid married boyfriend, who was also completely two-dimensional. The dialogue felt artificial and flat throughout the book and there was too much telling rather than showing. In Rose's obsessive search to find out the truth about what happened, she temporarily thought she discovered something that so quickly turned out to be a red herring that I have no idea why it was even included. This whole story felt contrived, and though I see the value of including this present-day story, it was poorly executed. Also disappointing was the over-used technique of beginning the story with the major tragedy, which is an obvious ploy to keep readers interested. Although this works well in some books, it's turning into a cheap trick that is overused and in many cases I think it's because there's nothing else that will propel the reader through the story. That was definitely the case with this novel. My need to learn about Darby's involvement in the death of the hotel maid was basically the only thing that kept me going. I was never able to become lost in this story, even the 1950s one, because none of it felt quite real enough. I mentioned many of my issues above, but also some of the sentence-level writing was troublesome and pulled me out of the story. For instance, a dog was described as having "quite the bitchy personality," which was rather colloquial phrasing that didn't quite fit in. Similarly, when present-day Darby was introduced to Rose's love interest/coworker, she responded, "Jason Wolf. Quite the name." It was similarly awkward phrasing that didn't quite fit, but also...what is supposed to be so unusual about the name Jason Wolf? I have no idea. Since it's not out yet, there aren't a lot of reviews on Goodreads and mine is one of the few low ratings. I gave it 2 stars on Goodreads (which means "ok") because I thought the writing was so poor, but the whole idea was pretty good which made it extra upsetting that it wasn't executed well. Reading it wasn't all unpleasant, but at a certain point I did just push myself to finish so it would be over with. I didn't want to stop because I wanted to find out the truth of the story (see: "cheap trick" above.) I suspect I'll shy away from galleys I know nothing about for a while in favor of choosing books that I know I want to read. The Dollhouse will be released in August. I received my copy courtesy of the publisher. I was not compensated for this review.